The Canadian Expeditionary Force (CEF) was the entire overseas force fielded by Canada during the First World War. Of the 630,000 Canadians who enlisted for military service, 424,000 went overseas as part of the CEF. The Canadian Corps that fought on the Western Front was the CEF’s largest formation and its principal combat element, but not its only one. Other units in the CEF served outside the Corps, including the Canadian Cavalry Brigade, forestry and railway units, and various medical hospitals. Canada’s first fighting division in Europe, comprised mainly of troops from the First Contingent who had sailed in fall 1914, served as an individual division under British command. The growing size and complexity of Canadian forces overseas led in September 1915 to the creation of the Canadian Corps, an operational and administrative grouping of most Canadian fighting units and their supporting services. At first commanded by British Lieutenant-General Sir E.A.H. Alderson and, from May 1916 to June 1917, by British Lieutenant-General Sir Julian Byng, the Corps grew from an initial establishment of two divisions with approximately 35,000 troops to a powerful striking force of four divisions with 100,000 troops by early 1917. 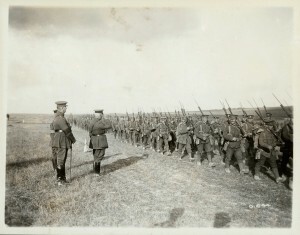 From June 1917, the Canadians were led by Lieutenant-General Sir Arthur Currie, a Canadian militia officer who rose during the war from command of a brigade to command of the entire Corps. Currie, who remained in command until 1919, is widely considered one of the war’s most capable generals. The Canadian Corps was a unique national formation that fought together for most of the war. While British corps usually consisted of an administrative or command structure through which divisions often cycled, and could be larger or smaller, depending on operational requirements, the divisions of the Canadian Corps almost always fought together. The soldiers of the four divisions and their supporting troops learned to work together and could pool resources to improve combat effectiveness. This cohesion and stability, jealously guarded by most senior Canadian military and political figures, bred a sense of identity and pride in national accomplishment among both soldiers and civilians.